« Why is Australian design so cool? Most people have probably seen this video, but it’s worth watching again. Dave Eggers won the 2008 TED Prize for his education and literacy work with kids, and in this entertaining acceptance speech he provides a brief history of his project. He’s the founder of the unbelievably successful Once Upon A School program which offers free drop-in tutoring centres for kids. The centres are entirely staffed by volunteers who tend to be writers (including Eggers), professors, grad students and self-employed professionals—all people who tend to have irregular, flexible schedules. Quite apart from the genius of the overarching idea, Eggers also intuitively understands how to design the sort of place that actually makes kids and teenagers choose to drop in for one-on-one tutoring after school. The spaces are wildly imaginative and hilarious without talking down to kids or looking overly childish. They must appeal to adults as well, because they are all multipurpose centres that also include adult office space. At 826 Valencia in San Francisco, Eggers’ publishing concern McSweeney’s Quarterly operates out of the back, there’s a functioning “Pirate Supply Store” in the front, and the kids’ tutoring area is in between. There’s nothing about this project that isn’t just total genius. 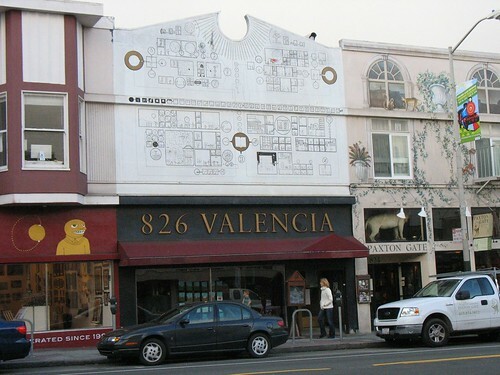 Below is the facade of 826 Valencia, decorated with a mural by graphic novelist Chris Ware depicting the history of language, speech, writing and publishing. 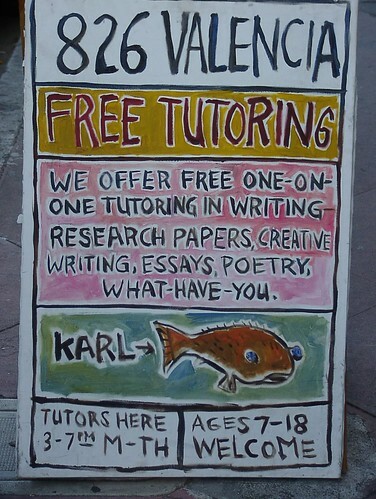 Exterior photo by David Hilowitz; sandwich board photo by Dan Rochman. Above is the Pirate Supply Store, built to feel like the inside of a ship. Photo by Willy Volk from the Flickr Creative Commons. 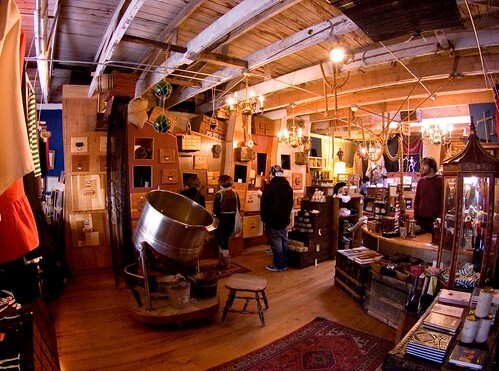 The shop is beautiful but funny and full of elegant-looking gags: for example, as you stand and read a framed list of ways to play practical jokes on pirates, a wooden hatch opens overhead and covers you in string mop heads. 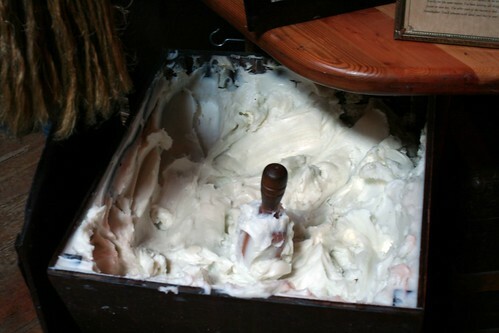 Below, a visitor to the store awaits his measure of lard in exchange for which he has bartered a lock of his hair. Kids who’d just finished a workshop rushed out to witness the transaction. Photos by rgr.jnr on Flickr. 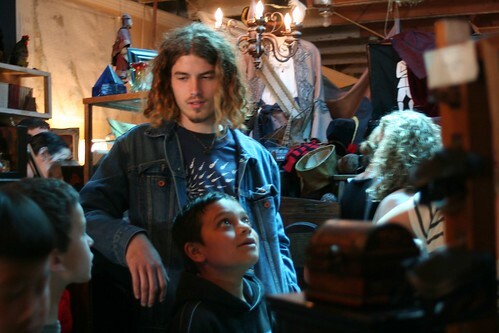 Eggers and co. were forced to dream up the store component because the building rental contract stipulated there must be retail activity – hence, of course, a pirate supply store, which surprisingly turned out to be a retail success in itself and now funds the school. Every centre has its own shop: in New York it’s the Brooklyn Superhero Supply Company. All profits from the stores go to support the tutoring centres, whose extra projects include publication of the childrens’ writing and field trips. The further advantage of the shopfront is that the centres are easily accessible and embedded in the neighbourhoods they serve. To date tens of thousands of kids have been given chances they would otherwise never have had. It’s not surprising that the idea has taken off so quickly across the country. When Eggers jokingly wrote “You shall know our velocity,” he wasn’t kidding. 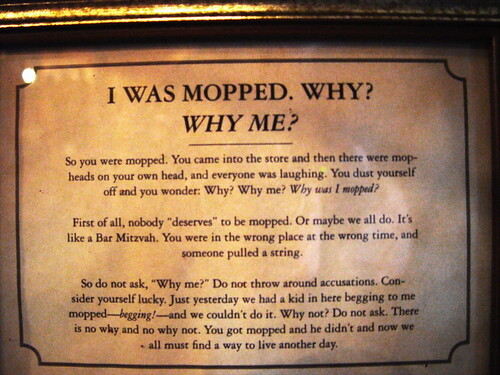 This entry was posted on Sunday, January 24th, 2010 at 11:23 am	and is filed under design, humour, urban planning. You can follow any responses to this entry through the RSS 2.0 feed. You can leave a response, or trackback from your own site. awesome, simply awesome man with a wonderful vision and amazing drive to get things working as they should. thanks so much for this post – it is really wonderful to see this.